Food Basics Flyer Halloween Deals 28 Oct 2018 contains specially discounted Halloween costumes and gifts. My favorite event is Halloween. We are celebrating all the family together with special costumes. It’s enjoyable! Find your favorite food for good and unbelievable prices at Food Basics stores now. Delicious and healthy food opportunities are on now. Special Halloween deals available until next week. Hurry up and find your favorite Halloween costume before they are sold. 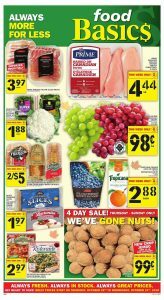 In Food Basics Flyer Halloween Deals 28 Oct 2018, special Wowza products available. From personal care to household products, discounted cause of Halloween. Click and get more detailed information about them. Shopping from Food Basics always cool and logical. Low prices are guaranteed. It is really hard to find cheaper than Food Basics flyer. Big brands saving event is on now. They are combined low prices with Halloween events. Check out and pick your delicious food between over a hundred.